Prayers Requested for Legendary Guitarist Tommy Allsup in ICU. Legendary rockabilly and Western swing guitarist Tommy Allsup is currently in the Intensive Care Unit according to his son and fellow musician Austin Allsup, and the family is requesting prayers for the 85-year-old. 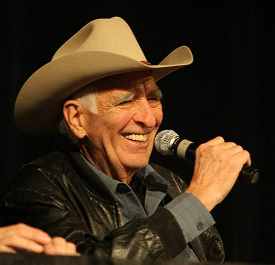 Tommy Allsup later became a producer and A&R man for Liberty Records, producing albums from Willie Nelson, Tex Williams, Billy Mize, and others. Allsup also produced the first United Artist Records release for Ray Benson’s resurgent Western Swing group Asleep at The Wheel in 1972, and the very last LP of Bob Wills in 1973. As a session musician, Tommy Allsup has performed on over 6,500 recordings, and is a member of the Rockabilly Hall of Fame. Tommy plays with waylon on that buddy holly tribute right? I know he played in the fender tribute, they got that rolling base line like surf music. Really cool how they would move from one song into another. Keeping the shuffle going through key changes. Our prayers are with Tommy. He’s a legendary musicians whom I got to meet and hear many times in Rudioso at the Lincoln County Symposium….Blessings from all of us. Cannot overemphasize Allsups importance to music! Produced so many people including Willie, Kenny Rogers, Charlie Rich, Bob Wills, Zager and Evans, Waylon, etc. He was so influential playing on virtually every Liberty Records release, many on Capitol as well. Buddy Holly It’s so Easy, Everly Brothers Cathys clown, Kenny Rogers The Gambler, Behind Closed Doors by Charlie Rich to name a few. Not to mention his success producing Western Swing for just about everybody. He’s a major MVP in music period. Hope he recovers. I think his humility is one of the reasons you don’t see him paraded around as a legend like you do some other players who’ve accomplished much less. Allsup deserves to be in both the Country and Rock and Roll Hall of Fames if you ask me. Tommy had a bar in Dallas in the ‘Deep Ellum’ area for a short lived while in the 80s called “Tommy’s Heads Up Saloon”. The man is a legend. My prayers go out to em. Our prayers are with Tommy and his family. We have had the great pleasure of listening to his music for many years at the Lincoln County Cowboy Symposium in Ruidiso, NM. I do know Tommy and his wife very well and we were in steady contact last year. I pray for my friend Tommy and the whole family. I’m sitting right now in the recording studio that Tommy built in Odessa, TX. He stopped by one day a few years back while he was in town to play a concert that evening at the historic Ector Theatre. I asked him to tell me the story in his own words of the coin flip with Ritchie. We talked about the recording sessions back in the mid sixties when Al Perkins and I with our band, The Shades, recorded a couple of songs with Carl Bunch, who was the drummer that was taken to the hospital with frost bite the night before the plane crash. I had bought the studio July 3rd in 1976. This was the first time I’d seen Tommy since buying the studio. He invited me out to the Ector Theatre to see the concert. He’s such a great guitar player. At Carl’s session we were in the control room listening to playback of “That’s the Way the Cards Fall”. I had played a guitar style and similar lick I’d heard on a Buddy Holly song on Carl’s song. Tommy asked me where I got the idea for the lick. I told him, “Oh! It was from Buddy Holly’s ‘Heart Beat’.” He said, “Good lick!” He didn’t say anything else about it, but a few years later I found out that Tommy was the guitar player on “Heart Beat”. He must have really gotten a real kick out of it. To this day he’s never mention the fact to me. What a wonderful man and player. My facebook cover is still a picture of Tommy and I at NAMM. I’m pointing to Tommy playing the smarty bit in It’s so Easy.